Unafraid to push the boundaries, a creative couple greenlights an unconventional design. Lark Carrier and Gerry Millet’s minimalist kitchen revolves around a massive island topped with a remnant slab of Brazilian Earthquake granite from Adamo Stone Design in Dorchester. An artfully asymmetric arrangement of cabinetry around the windows offers extra storage. “The design is minimal but still interesting,” architect Meejin Yoon says. Light boxes (like the one at left) on all four floors bring sunlight from windows at the back of the house into the main spaces. 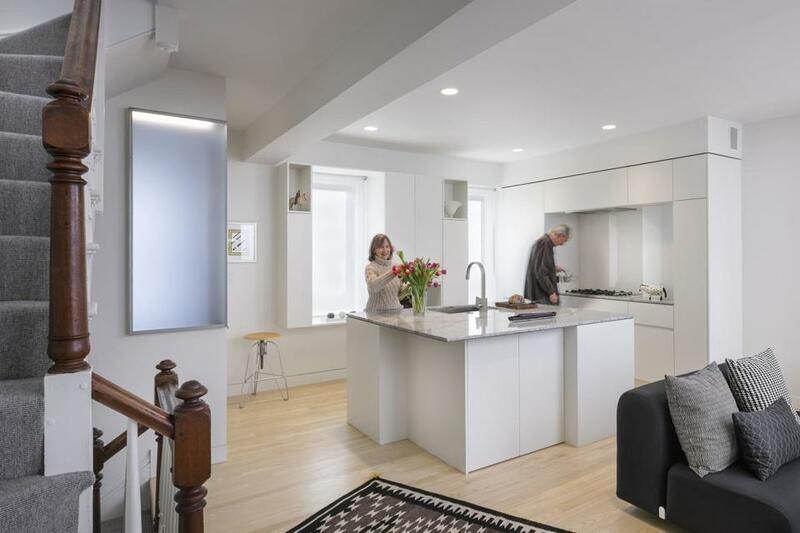 At first glance, Lark Carrier and Gerry Millet’s South End town house didn’t really need a renovation. “It was perfectly fine,” says architect Meejin Yoon of Boston-based firm Howeler + Yoon Architecture. Carrier and Millet purchased the 2,100-square-foot, four-story dwelling in 1994. The couple — Carrier is a children’s book author/illustrator turned painter and Millet is a retired ad agency creative director and photographer — lived and worked in the house contentedly for years, but knew at some point they’d re-imagine it. In 2013, they contacted Howeler + Yoon, remembering a 2007 article featuring a Chinatown loft project the firm had designed. They knew Yoon and her partner, Eric Howeler, were the only ones for the job. The goal was to modernize and bring light into the house while unifying the four floors. “Each level felt very separate as one moved though the dark stairwell,” says Yoon. At the same time, everyone agreed that new design elements should not supersede the historical elements, but rather work with and speak to them. Inspired by the mid-20th-century Italian architect Carlo Scarpa, whom Howeler admires for creating “great examples of discrete architectural interventions within a historic shell,” the architects called for what are essentially light boxes on each floor. Made from panels of frosted glass edged in stainless steel, the boxes render one corner of each floor translucent by allowing natural light to pass through the windows in the back of the house into the middle of the rooms. In addition, LED lights are embedded in the boxes, so at night, with the flick of a switch, they glow softly — and can be adjusted via dimmer. As their family grew, two architects gutted and redesigned their town house around them. 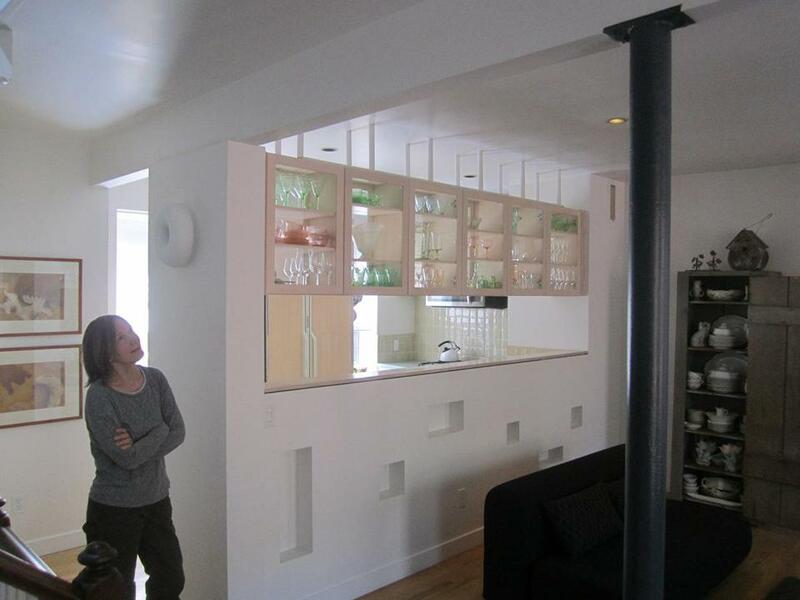 Before the renovation, a pierced contemporary wall separated a galley kitchen from the rest of the living space. Initially hesitant to remove the partition, Carrier is thrilled with the new design. “This kitchen functions flawlessly,” she says. Crews were also able to remove the dark column by rebuilding the ceiling to include a supporting beam. 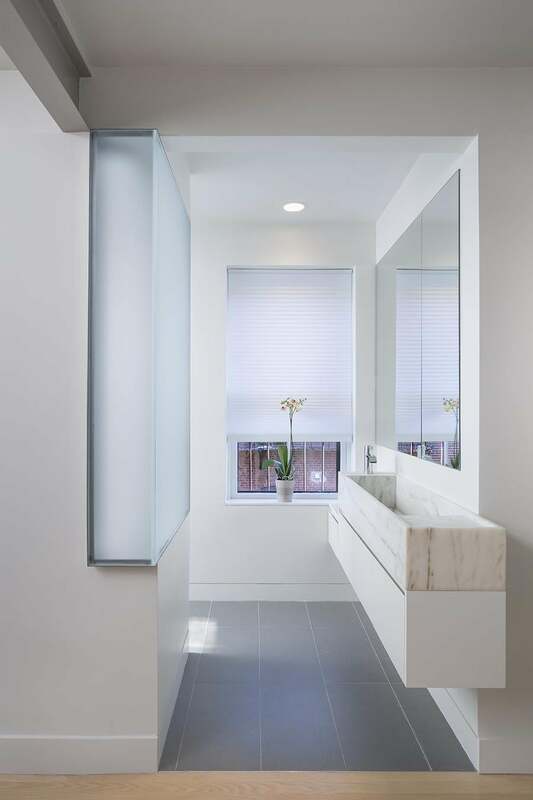 The light box in the master bedroom echoes the shape and scale of the sink and bounces light from the bathroom’s window and skylight into the sleeping area and down the stairs. More sunlight pours in from the stairwell that leads to the roof deck — the architects have a plan for the roof, too, awaiting execution. The red Tongue chair by Pierre Paulin is part of the same series as the curvy black Groovy chair in the living room. Outside the master bath, a sculptural sink made from White Danby marble and accompanying vanity appear to float on the wall. Their unusual shape and placement make a major style statement. “The homeowners encouraged us to be playful while working within the constraints of the existing layout,” Yoon says. The ash floors in the living room were refinished and the whole house treated to new paint. 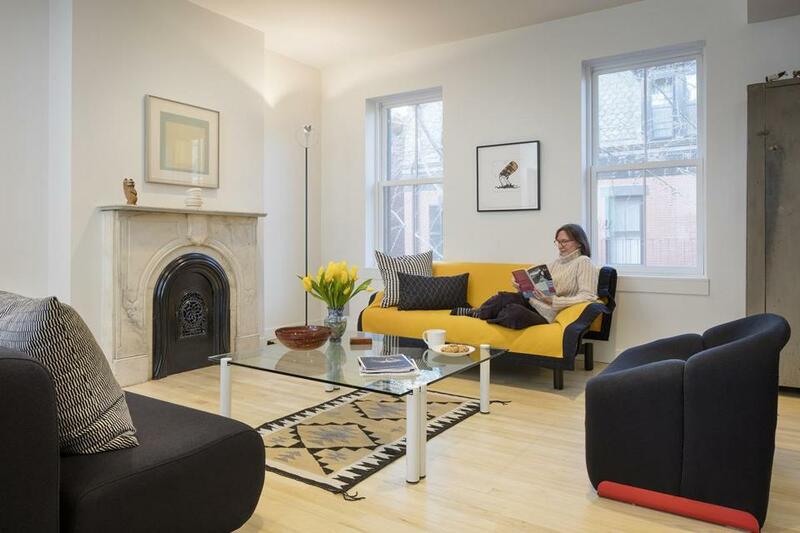 Yoon says Benjamin Moore White Dove works well in historic brownstones, helping to reconcile “contemporary elements with traditional.” A Josef Albers print hangs over the original marble fireplace and Navajo rugs from the couple’s collection are scattered about. The timeless SINDBAD sofa, designed by Vico Magistretti for Cassina, has a thick, blanket-like cover in yellow that can alternate with one in red.